Kierkegaard 1 distinguishes between our “task” (or duty), as an individual, and our “accomplishment” within a broader system of relationships. The latter, he argues, is in large part out of our control. Our primary concern should be to complete our “task”—leaving our accomplishments to take care of themselves. “The phrase ‘to accomplish’ signifies a relation between my action and something else that lies outside me. Now, it is easy to see that this relation does not lie in my power, and to that extent it is just as appropriate to say of the most talented person as of the humblest of men—that he accomplishes nothing. This implies no mistrust of life; on the contrary, it implies an acknowledgment of my own insignificance and a respect for the significance of every other person. The most talented person can complete his task, and so can the humblest of men. Neither of them can do more. Whether they accomplish something is not in their power; it is, however, indeed in their power to prevent themselves from doing so. So I surrender all that importance that often enough throws its weight around in life; I do my work and do not waste time calculating whether I am accomplishing anything. What I accomplish accompanies my work as my good fortune; I certainly dare to rejoice in it but do not dare attribute it entirely to myself” (Either/Or,II 295). And what is our “task” in life? Our task, it seems, is to be ourselves. But what does it mean “to be ourselves?” To begin to understand this, it is helpful to think of the “essence” of an individual which at first exists only “potentially,” but which gradually becomes “actual.” Think, for example, of a biological organism, the essence of which is contained in a seed; take, for instance, a pine tree 2 or a stalk of corn. 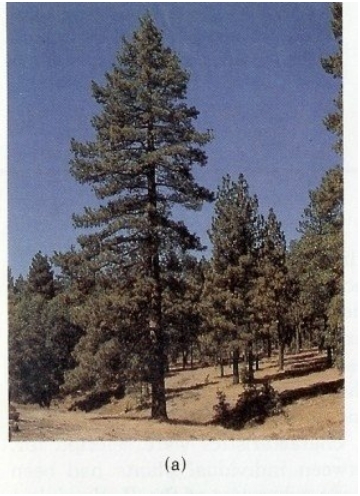 The pine seedling strives, in a manner appropriate to its proper environment, to actualize its essence, as does the corn sprout. Wherever these plants find themselves— in the north woods, perhaps, or in the rich farm land of the Midwest —they do not cease striving to be that which they are. Whether or not circumstances are conducive to their actualizing their potential, and whether or not pine trees or corn are more highly valued in the broader scheme of things, they are true to themselves, even unto death. As human beings, however, we sometimes lose (or even flee) ourselves or become otherwise alienated from our essence. Our ability to consciously reflect— which is our greatest asset so long as we stay in tune with ourselves and our task —is a mixed blessing inasmuch as it opens up the possibility of despair—of our wanting to be other than that which we are. Often, we despair because the conditions in which we find ourselves makes our “success” extraordinarily difficult and “accomplishments” unlikely—regardless of how hard we strive to become that which we are. But such despair can only exacerbate our hardships. When I speak disparagingly of “wanting to be other than that which we are,” I do not mean that we should never change professions or that we ought not strive to be more than we actually are at this point in time; rather, I am saying that any change desired is appropriate only insofar as it constitutes the bringing into actuality of that authentic life which lies potentially within us—that which we already are essentially. To want to be entirely other than we are is to be in despair. “A beech tree grows, amasses its crown, and people take pleasure in sitting in its shade. If it were to become impatient, if it would say, ‘Scarcely any living creature ever comes to this place where I am standing; what is the use, then, of my growing, of thrusting out my branches; what am I accomplishing by doing that?’ it would only retard it growth, and some day a traveler might come along and say, ‘If this tree had been a full-leafed beech instead of a stunted runt, I would have been able to rest in its shade.’ Just imagine if the tree could hear!” (Either/Or,II 295). Let us, then, commit ourselves unconditionally to our task! Let us strive, as Nietzsche says, “to become those we are.” We need not imagine that this entails our obedience to any law imposed upon us from outside. Rather, it means we would do well to submit to the law of our own true nature—a law originating within ourselves, obedience to which is the necessary condition for the fullest experience of life and truth. Kierkegaard, Søren. Either/Or, II. Ed. and Trans. Howard V. and Edna H. Hong. Princeton: Princeton University Press, 1987. 2. 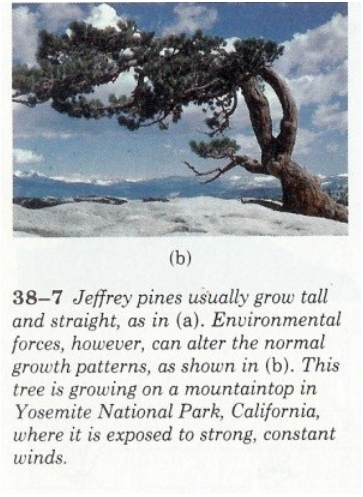 The pictures of the Jeffrey Pines are from, Invitation to Biology, Fourth Edition, by Helena Curtis and N. Sue Barnes.